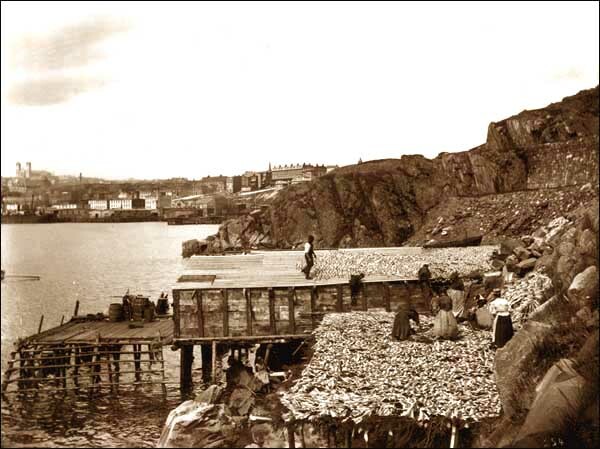 The origin of what is today referred to as traditional society in Newfoundland and Labrador may be traced to a way of life that developed around the inshore fishery in the late 19th century outport. Although this way of life focused on the family as the basic unit of consumption and of biological and social reproduction, the household was the locus of production and welfare. Each household member was expected to assist in some way in making a living from the sea and the land, with the division of labour based largely on gender and age. These households would also include non-family members of both sexes who assisted at a range of jobs on the land and in the fishery. 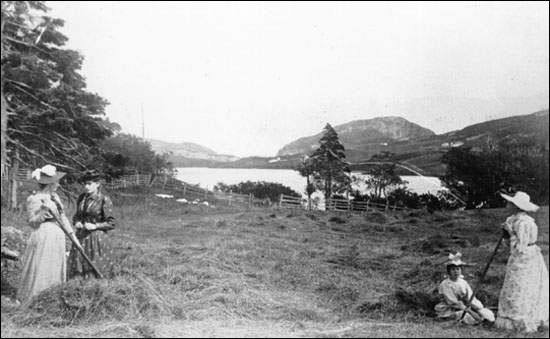 Haystack, Placentia Bay. Gardens were important to the household economy. Photographer unknown. Reproduced by permission of the Maritime History Archive (PF-285.011), Memorial University of Newfoundland, St. John's, NL. This was not necessarily work for pay, however, as labour was exchanged within and amongst households on the basis of what is called a moral economy -- essentially non-market values that reflected ethical commitments to kin, community, and even nature itself. While household members might be involved in formal economic production in fishing, trapping, lumbering, or even farming, much work was also undertaken as informal economic activity in which people produced primarily for their households' or communities' subsistence needs, exchanging any marginal surplus. Households scheduled these formal and informal activities in an annual cycle where energies were shifted into each pursuit at its most advantageous stage. This variety of work determined the household's subsistence and often made the difference between starving and sufficiency. The household could also provide a setting for class and domestic conflict. By examining the general structure of working class life in late 19th and early 20th-century outports, we may hope to understand more completely the importance of the household economy in its full context. Levels of prosperity and self-sufficiency in Newfoundland and Labrador outports varied over regions and time, as did the cycles of work and life in the fisheries of individual Newfoundland and Labrador villages. 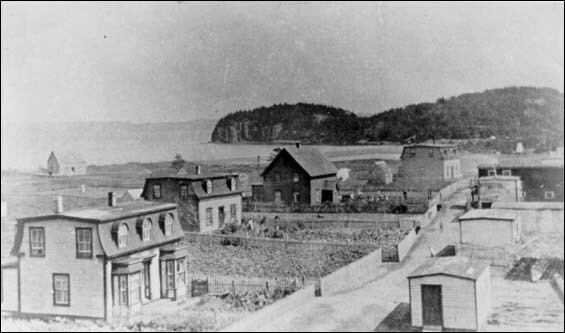 Men in Grand Bank, for example, were heavily involved in a schooner fishery in the late 19th century, while in Conception Bay whole households were also involved in the long-distance Labrador fishery. There were also variations in class, with some better off than others. We will examine an “average” household's work and life activities. The fishing season began in May and involved men, women and children. The men set up or repaired the stage, went “in the bay for rinds” (strips of bark to roof the stage and protect drying fish from rain), readied the boats and gear, and caught the bait. Then they headed for the fishing grounds. Before 1900 most people fished with handlines, trawls or seines, and they spent most of their day at sea, eating there and sometimes sleeping there, as their day started so early. These fishermen made only one trip a day so, there was only one boatload of fish to be put away. This meant that their wives and children did not have to spend all day working at the fish. They could do their housework and chores at a more leisurely pace than the households of those fishermen who used cod traps, who sometimes had to handle up to five large boatloads of fish a day. A handline crew was also likely to be smaller, with each member doing several jobs in the curing operation. After they caught the fish, by whatever means, they loaded it off the boat and then brought it in barrows to the main part of the stage and onto the splitting table. The handline men were then free to go home and sleep till the next day, leaving the women and children, and a few men, to split and prepare the fish for cure. While women and men could be involved in the splitting process, with children assisting, mostly women and children would do the “spreading out” and “piling.” Though if the fish were spread out and the weather changed, all available would race to get the fish under the rinds or a tarpaulin in order to protect it from the rain, which would wet the fish and reduce its quality. Women working on flakes, Outer Battery, St. John's, n.d.
Women's economic roles in the fishing industry were extremely important in 19th-century Newfoundland and Labrador. Photographer unknown. Reproduced by permission of Archives and Special Collections (Coll. 137 03.07.006), Queen Elizabeth II Library, Memorial University, St. John's, NL. Shore crews processed the fish mostly during the summer during dry, sunny weather. Shipping, selling fish to merchants, began in August. By the end of September, if the catch was “light salted”, work with the fish was over, but if the fish was “heavy salted” the crew sometimes worked into October and November. In some areas in the 1800s, when the summer fishery was through, men left their summer quarters to go “in the woods” to live in tilts (rough-hewn log cabins). It was there that they did their “winter's work,” either cutting cask-staves and hoops for the barrels used by merchants to ship fish to the international market, or sawing board and cutting wharf sticks and firewood. 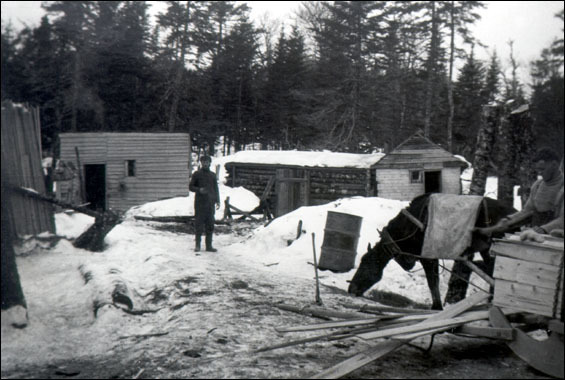 In later years, this practice of seasonal migration died out in most parts, though woods work in the winter remained important. By the late 19th century the development of lumber mills and mines also meant that men could spend the winter as loggers or miners. For those men who stayed at home, their chief winter work was cutting firewood and hauling it out of the woods with their dogs or ponies. In the days of the open fireplace, before the introduction of the more efficient wood stove in the mid 19th century, a household could burn a whole slide load of wood in just two days. This meant that the gathering of wood occupied a lot of time. Lumber Camp, Jacks Pond, Trinity Bay, n.d.
With the opening of lumber mills and mines in the late 19th century men could spend the winter as loggers or miners. Photographer unknown. Reproduced by permission of the Maritime History Archive (PF-103.3-D11), Memorial University of Newfoundland, St. John's, NL. Men would also spend their winter mending fishing equipment as well as hunting and trapping. In the spring, for example, they killed any seals that drifted close to shore on the ice. Slaughtering livestock in the fall, for a rare meal of fresh meat, was also men's work. Other men, particularly those from the northeast coast, would leave in March for a month or more to take part in the seal fishery. This provided them with a much-needed source of cash to buy supplies in the lean days of spring. To add to their food supplies most households kept gardens, tended by the women. Gardening work began in the spring when women and children would “pick the ground”, that is, go over the meadow inch by inch, picking up stones and any other debris that accumulated during the winter. Men usually did the ploughing and digging of potato plots, but both men and women sowed. Women looked after smaller plots, of turnips, carrots, parsnips, beets and cabbage. The vegetables were fertilized with material from the sea: caplin, cods heads and “sound bones” (back bones). In late July or August, “making grass” or hay for the animals' winter fodder was a household affair. The men cut the grass with scythes or sickles. The women spread it out to dry. The next day, they raked it into rolls, and the evening after, it was placed in tiny stacks all over the garden. The following day, it was made into larger stacks and finally, into one big stack that could be easily moved into a barn. Unidentified women making hay, n.d.
Newfoundland and Labrador women engaged in a variety of tasks during the 19th century that contributed much to the overall income of their households. Courtesy of The Rooms Provincial Archives Division (A12-122), St. John's, NL. The animals they kept were the usual ones for small farms: cows, goats, pigs, chickens, and occasionally a horse. Such a variety, though, was probably rare in the late 19th century. The households that kept animals would have been able to supplement their diet with dairy products, eggs and fresh meat. Most would also have used the gleanings from the nearby woods and shoreline, such as berries and shellfish. In October, the vegetable harvesting would begin. This too was usually a household affair, but if the men were away, the women and children would tend to it, as they did the other chores. Most vegetables were stored in root cellars. Housework was year-round and was exclusively the woman's domain. Women and girls had to cook, set the table, wash the dishes, do the wash, iron, sew, sweep the floor, and rock the baby. Some activities took place on certain days, for example, scrubbing might be done on Saturday, as was polishing shoes, cleaning the cutlery, and preparing Sunday clothes. Making bread could be done every day of the week except for Sunday. Added to the round of housework and child-raising were activities such as carding and spinning wool and knitting it into garments, “fancy work”, sewing (making clothes and joining quilts), and making mats. While many of these were winter occupations, the activities surrounding them were year-round. Men sheared the sheep in late spring. After this, the women washed the wool and hung the fleece on a fence to dry. In the fall, the children, usually girls, had to pick the fleece free of debris, such as twigs. It was then ready for carding, or combing, after which it was spun in various thicknesses for various needs. Next, it was put in skeins and washed. Finally it was rolled into balls. Woolen garments were a necessity in winter and some were worn all year, so all females knitted. They produced petticoats, stockings, hats, mittens, cossocks (face masks), underwear, and especial1y sweaters. Quilting was another winter job, as was making mats. This handwork was often looked upon as a break from everyday routine.